Of all the freelancing platforms available, iFreelance stands out for two key reasons: they charge zero commissions, and they offer freelancers unlimited bids for projects. Their primary mission is to be a network that connects employers to talents, which means that after connecting the two parties, they try to remove themselves from the process as much as possible (which is why they don’t charge commissions or transaction fees). This does have its downsides, however: if you run into a dishonest individual, you’re on your own. Of all the freelancing platforms available, iFreelance stands out for two key reasons: they charge zero commissions, and they offer freelancers unlimited bids for projects. In lieu of commissions, iFreelance charges a reasonably low monthly membership fee with a few tiers available. The higher tiers allow you to showcase more of your work and bid for jobs in more category listings. 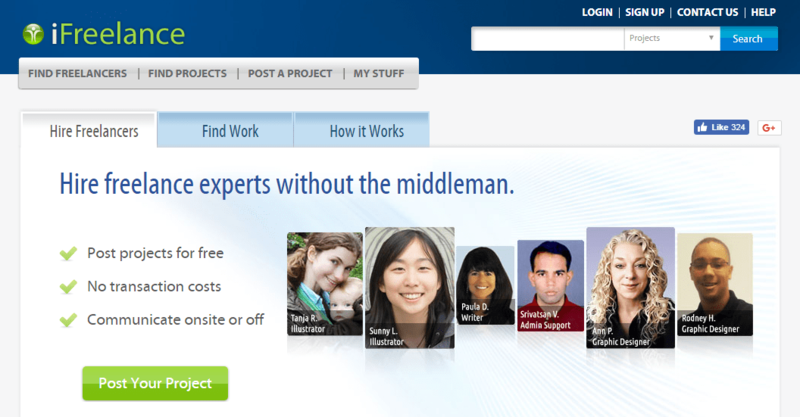 iFreelance’s primary pitch is that you can hire expert freelancers while cutting out the middleman. This sounds great in theory – zero commissions, zero transaction fees, and a sizable platform on which to source for work or workers – but it does come with a few catches. For instance, there’s no Escrow payment available, which means you run the risk of not getting paid for your work. iFreelance also does not maintain any official record of your communications, so you’re on your own if you come across a dishonest individual. Wondering if iFreelance is the best option for getting your project done? On the hunt for top-notch coders, graphic designers or creative writers? iFreelance will showcase them for you. Their specialties focus predominantly on artistic professionals, such as illustrations, web designers, creative writers and so forth. The motto behind iFreelance is to showcase the best professional freelancers to companies that are willing to pay for good quality. So, essentially, if you are working on a tight budget, iFreelance is not for you. iFreelance’s monthly fees (starting from $6.25) sift away numerous but inefficient freelancers advertised in other giant freelance websites. The requirement to issue payments during the registration process insures that freelancers have a valid credit card for international transactions and can honor payment for the services on the site. Monthly fees constitute the only charges in exchange for services. Once you become a legit iFreelance member, you are free to interact with the other members. However, just bear in mind your account is limited to the specific work category pointed out during registration. Access to other areas binds you to open an additional basic account. Censorship concerning posts’ content on the site is meant to ensure your work’s safety through iFreelance. There are more than 1,500 freelancers registered on the site, which advertises 20-30 work projects per day. This doesn’t mean that the things are slow on iFreelance. You are welcome to browse through the freelancers’ profiles and invite them to bid on your specific project. The classic scheme of the more you pay, the more you get is alive and well at iFreelance. The basic account entitles you to access limited features. This will allow you to more or less survive as an active member of the site. However, it is unlikely to land you any substantial bids. The moment you register, you are asked to define the category you’ll be dealing with and to add an option, let’s say you have writing and translation skills. Otherwise, you will have to pay and maintain two+ accounts if you strive to showcase multiple areas of expertise. iFreelance doesn’t act as a go-between employers and freelancers. It’s method is based on monthly fees, as opposed to calculating commissions on every monetary transaction. When all is said and done, you are on your own to close a deal and make payment procedures. Compared to its competition, iFreelance website lacks in design, particularly on mobile devices, which gives the feel of an outdated platform. Posting a project requires you to fill-in a long and detailed application form. You’ll be asked numerous relevant questions and if you merit the privilege of being accepted, you will be required to give your credit card information right away. No money, no deal. You will not even be allowed to browse around in “read-only” mode until you pay at least the basic monthly fee. This deters many new freelancers. The navigation on the site is rather tricky despite its seemingly user-friendly looks. The moment you find a freelancer that complies with your project, you are forbidden to PM him/ her. Your only option is to invite your prospective freelancer to bid on your job posting. Given iFreelance charges monthly fees, it would be natural to assume that they would feature top-notch tech support, but it doesn’t. iFreelance e-mail support is easily accessible through every page of the site, by pressing the “contact” icon. Get your time zone calculator handy, as the tech support will only process your tickets 6 am – 5 pm Pacific time, Monday to Friday. You can expect an answer within one business day, though it can take a little longer. 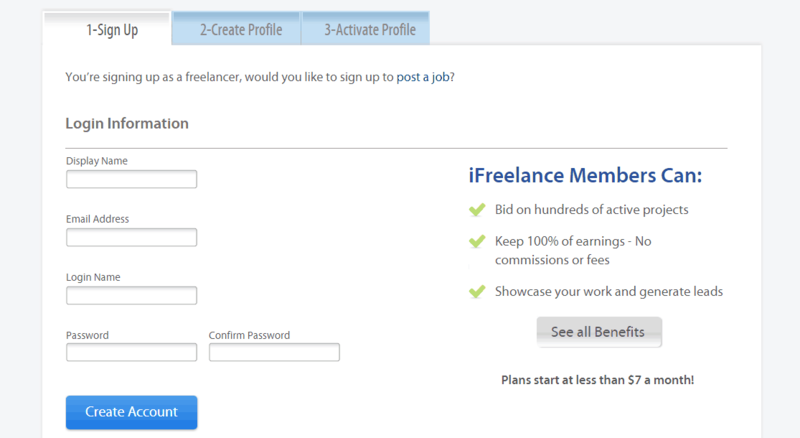 Fees charged at iFreelance are related to freelancer monthly accounts. Some freelancers have complained that iFreelance is charging too much for every additional section a freelancer adds to his/her working fields. However, the prices are reasonable, going from $6.25 to $12 per month. iFreelance claims its services to employers are entirely free. However, in certain instances, they charge a fee to post content or for other features, products, services or licenses. It’s not clear whether the above apply exclusively to freelancers or to employers as well. iFreelance doesn’t conduct payment through the site. This is very convenient as it extricates you from the requirement to transfer and withdraw funds. No payment system means no Escrow either. This is convenient for people who prefer using their own payment options, but lack in security. This site is ideal for seasoned freelancers, who have gained previous experience from other freelance sites and who are familiar with the inner workings of freelancing. This definitely justifies the monthly fees charged by iFreelance. The site’s structure and functions are somewhat rigid. But you can work your way to the top lists of freelancers by purchasing a premium account, with additional paid features on offer. iFreelance is an adequate choice for employers seeking pro artists and writers with impressive portfolios. Novices to the freelancing world are recommended to gain some experience through other platforms before opting for iFreelance. Otherwise, they will feel disappointed and ripped off.